Leaving high school and going to college is complicated for everyone. But if you're a student on the autism spectrum who is about to enter higher education for the first time, it might be a little bit more complicated for you. Maybe you're worried about getting accommodations, getting places on time, or dealing with sensory issues in a new environment. Maybe you could use some advice on how to stay healthy at school, handle dating and relationships, or talk to your friends and classmates about your disability. Maybe you want to talk to someone who's already dealt with these issues. That's where we come in. Navigating College is an introduction to the college experience from those of us who've been there. The writers and contributors are Autistic adults, and we're giving you the advice that we wish someone could have given us when we headed off to college. We wish we could sit down and have a chat with each of you, to share our experiences and answer your questions. But since we can't teleport, and some of us have trouble meeting new people, this book is the next best thing. 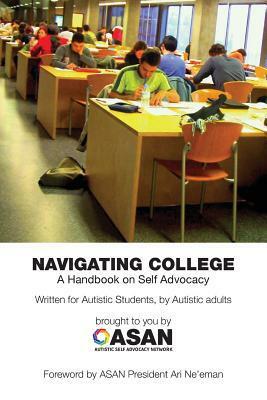 So as you go back to school, check out a copy of Navigating College for yourself or your loved one. We've done this all before--let us help you out. As an autistic adult with 2 masters degrees who works as a disability access consultant with disabled University students, this is the single best book about disability, neuro diversity, adult life, and college that I've found, largely due to the breath of personal expertise and experience shared within a disability justice framework. Really appreciate the larger lettering and the format that makes it easy to read and understand. Great tips too! For more information or questions about bulk orders, please write to info@autisticadvocacy.org.